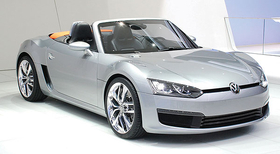 Sources say the VW roadster concept will go into production if Porsche and Audi want derivatives of the car. The three carmakers already build SUVs together. DETROIT -- The roadster concept Volkswagen debuted at the auto show here last week will be built, if Porsche and Audi want it too. To make a strong business case for the new roadster, we need to share the investment with at least three brands, a senior VW group executive told Automotive News Europe. Audi already has designed its variant of the new roadster, a second VW source said. He added that Porsche wants to add a car to its lineup that will lower the entry price for the brand and reduce the carmakers overall CO2 emissions. The lowest-priced Porsche is the Boxster, which starts at 45,300 in Germany. The roadster is expected to start at about 30,000, which the source said would make it too expensive to become a variant for VW group automakers Skoda and Seat. When asked by ANE at an event in Munich last week whether Porsche has any interest in the roadster, CEO Wendelin Wiedeking said he could not comment on future product plans. VW, Audi and Porsche already have a three-way agreement for premium SUVs. The VW Touareg, Audi Q7 and Porsche Cayenne share the same platform. Within two months, VW is expected to announce whether it will make the roadster. A production-ready version of the car, called the Concept SportBlue, debuted in Detroit with a 180hp diesel engine linked to a six-speed dual-clutch transmission.